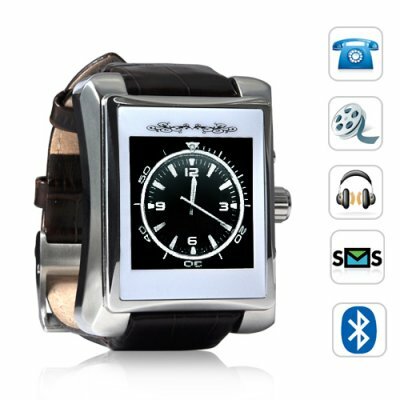 Successfully Added Suave Cellphone Watch - Premium Mobile Phone Dress Watch to your Shopping Cart. The Suave, a new cell phone watch with the perfect combination of style and communication excellence. This high-class premium quad-band cellphone watch easily matches your Armani business suits, D&G sunglasses, Channel dresses, and your most luxurious accessories. Holding the Suave Cellphone Watch in your hand for the first time, you will immediately notice the flawless stainless steel construction, pearl inlaid rectangular face and deluxe leather strap. With a beautiful 1.5 inch glass LCD display, your friends and colleagues will probably think you are wearing a new Swiss-made hand crafted watch. All traces of the cell phone functions are meticulously placed in such a way that they are not easily noticed. Carefully thought out details such as including a new ultra-flat polymer rechargeable battery and hidden mini USB port to make sure that the Suave Cellphone Watch has the same size and style as a normal dress watch, so the casual observer will never notice you are wearing a mobile phone watch. Because of the light weight and classic dress style of this watchphone, you will want to wear it every day and for every occasion. Since this is a quad band GSM mobile phone watch, you can use it all around the world, making your life much easier. Take it when you give a keynote speech at Light+Building in Frankfurt, wear it when you are visiting the Tokyo Game Show, and feel free to keep it on when you are attending the Oscar dinner party in L.A. You may even find that Brad Pitt and Steve Jobs keep looking at you and then finally asking where you got your stylish wrist watch. Just don't tell them that it a factory-direct Wholesale Cellphone Watch (let it just be our secret). With all of the features of a modern mobile phone slapped on your wrist you can forget about having to carry around your normal phone. The Suave Cellphone Watch provides for all your daily communication needs and also includes a multimedia player that you can use to enjoy your favorite music and movies when you have some down time. While everyone else is still using their out-of-fashion, brick-sized cellphone, you can have 21st century mobile communications on your wrist -- that is the style and uniqueness provided by the Suave Cellphone Watch. Style, Elegance and Quality are what make this mobile phone watch unique. Once you wear it, you will wonder how you ever managed life without it. For its world introduction, we have already produced enough for two warehouse slots (246B and 283L) so that it will be assured of being in stock for immediate shipment. Place your orders today and we will express ship it out tomorrow. Brought to you exclusively by chinavasion.com! 2GB micro SD card included - FREE! Can I change the ringtone on this watch phone? This phone comes with default ring tones. Or you can easily use your own music track as a ring tone. Better yet, use the sound recorder function to record your own voice and use that as your ringtone! Does this mobile phone watch have and IMEI number? The Suave Cellphone Watch has a genuine international IMEI (International Mobile Equipment Identity) number for better user security protection. Why are there only 6 numbers in the dial screen? Where are the rest of the numbers and keys? Please don't panic, simply scroll up/down to get to the other numbers and keys. Is the Suave Cellphone Watch waterproof? It is water resistant, meaning a little rain on it will be fine, but do not submerse it in water or allow it to be under constant water pressure.